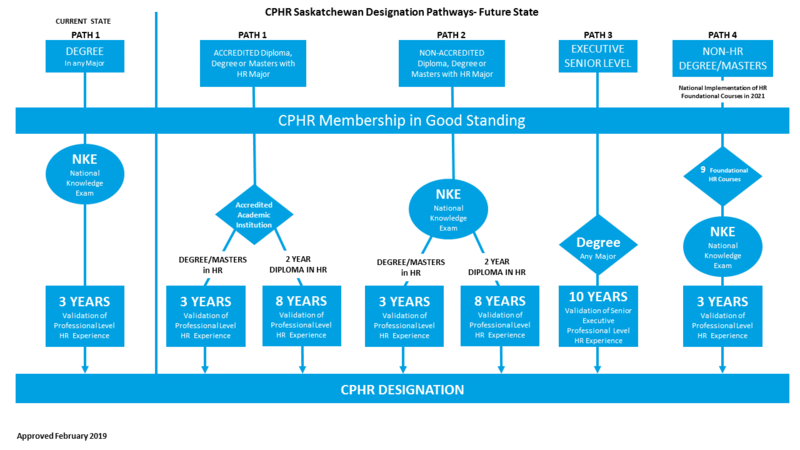 New pathways to the CPHR designation, including a non-degree route and an executive senior level route. 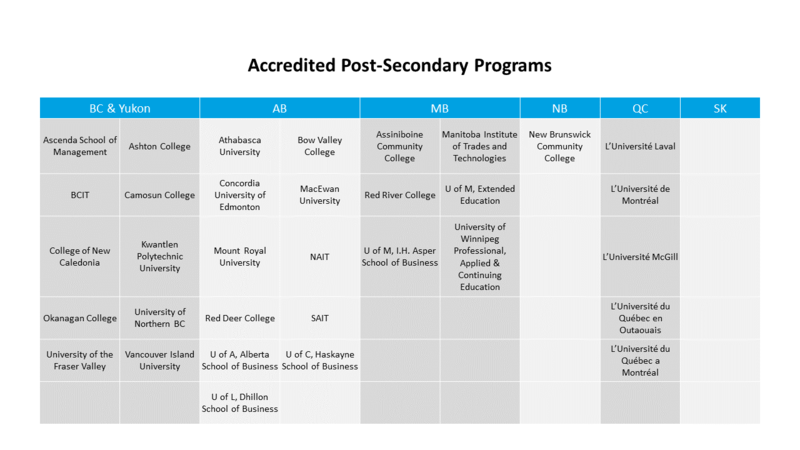 Accreditation of certain HR courses in partnership with key post-secondary institutions in Saskatchewan. New HR foundational course requirements for non-HR degree candidates. The Chartered Professionals in Human Resources (CPHR) designation represents a commitment to a national standard of excellence and sets a benchmark for the professional practice of Human Resources, provincially and nationally. The designation emphasizes the strategic importance of HR management and is important in securing HR's role in creating positive business outcomes.In February 2019, after extensive research and consideration, the CPHR Saskatchewan Board of Directors approved new designation pathways to obtain the CPHR designation. These additional pathways help to align CPHR Saskatchewan with other provincial CPHR associations. The CPHR Saskatchewan Board of Directors understands the importance of being aligned with CPHR Canada colleagues to ensure the transferability and recognition of the designation between all provinces and territories. The Board also understands that its most important mandate is to serve the interests of its stakeholders in Saskatchewan. The additional designation pathways serve the interests of CPHR Saskatchewan both nationally and provincially. The pathways continue to uphold strong standards and maintain the integrity of the designation. At the same time, they help to reassure government and other stakeholders that the profession is representative of the entire practice and all constituents within organizations who create healthy, safe, and productive work environments. This is an important consideration on the path to becoming a regulated profession. Each pathway recognizes the importance of both Human Resources specific education and Human Resources professional level experience aligned to the CPHR Competency Framework. Recognizing that educational standards may differ between pathways, the Validation of Professional HR Experience (VOE) application requirements remain the same (though time requirements may differ), and adherence to these requirements ensures that standards remain high. Students who graduate from an accredited program with an overall average grade of 70% or higher will be eligible to waive the National Knowledge Exam (NKE) and move straight to the Validation of Experience (VOE) portion of the CPHR path. Accreditation is a significant step forward for the Human Resources profession, providing accredited post-secondary institutions with a strong competitive advantage for students who want to pursue a HR career. This program gives CPHR Saskatchewan the opportunity to officially recognize the knowledge that students gain from participating in post-secondary programs focused directly in the HR field and competencies. Partnering with post-secondary institutions will align curriculum to professional competencies. At present, there are no accredited programs in Saskatchewan. In the coming months, CPHR Saskatchewan will commence this work with academic institutions that offer HR programs in the province of Saskatchewan to determine their interest in pursuing accreditation. If academic institutions confirm interest, work will commence and the details (e.g., timeframe) will be established, as both parties work together. Nationally recognized foundational HR course requirements will help to ensure alignment and standards for non-HR degree professionals. Effective July 2021, for non-HR degree professionals, a minimum number of foundational HR courses will be required to write the NKE. lf the courses are completed through an accredited program, further courses are not required. Foundational courses will be offered online through a third-party provider and will cover all the key competency areas. Below, you will find additional information and details around all of the above changes. Should you have any questions, please visit the Frequently Asked Questions (FAQ's) page. New Pathwayswill ensure comprehensive access to the designation while maintaining high professional standards. Partnering with post-secondary institutions will align HR course curriculum to professional competencies. Nationallyrecognized foundational HR course requirements will ensure alignment and standards for non-HR degree professionals. Your Board of Directors is committed to open and transparent communication on these and other changes impacting our members. CPHR Saskatchewan will offer additional opportunities for members to ask questions and of course, you are always welcome to contact the office directly for assistance.